The relay is a well known and widely used component. Applications range from classic panel built control systems to modern inrefaces between control microprocessors and their power circuits or any application where reliable galvanic separation is required between different circuits. Altough considered to be a relatively simple component, the electromechanical relay and its technology is complex and often misundestood. The earliest electrical relays were developed in the 1830s, as people began to recognize that such switches could be extremely useful. Historically, electrical relays were often made with electromagnets, which continue to be used today, although for some applications solid state relays are preferred. They key difference between electromagnetic and solid state options is that electromagnetic relays have moving parts, and solid state relays do not. Electromagnets also conserve more energy than their solid state counterparts do. One of the reasons an electrical relay is such a popular tool for electricians and engineers is that it can control electrical output which is higher than the electrical input it receives. In the example discussed above, if the ignition connected directly to the battery, heavy duty insulated wiring would be needed to connect the steering column to the battery, and the ignition switch would also need to be much more robust. By using a relay, relatively lightweight wiring can be used, saving space and increasing vehicle safety. A variety of circuits can be connected to an electrical relays. Relays can be used as amplifiers for electrical energy, as in the car example, and they can also connect to things like alarm switches, activating when a circuit is broken to trigger an alarm. Many electrical failsafe systems utilize electrical relays which turn on or off in response to things like a current overload, irregular current, and other issues which may arise. These electrical relays trip to shut the system down until the problem can be addressed. All documents, EE software and EE books are free to download. 1 Relay Selection Guide . 2 Distance Relay Fundamentals . 3 Line Protection With Distance Relays . 4 Electrical Relay Diagram and P&ID Symbols . 5 The philosophy of protective relaying . 6 The Art and Science of Protective Relaying . 7 Protective Relaying – Principles and Applications . 8 Transmission Line Protection Principles . 9 Electrical Plan Review Booklet . 10 The Basics Of Power System Protective Relaying . 11 Schematic Representation Of Power System Relaying . 12 Guide to protection of power systems with distributed generation . 13 Operation, maintenance, and field test procedures for protective relays . 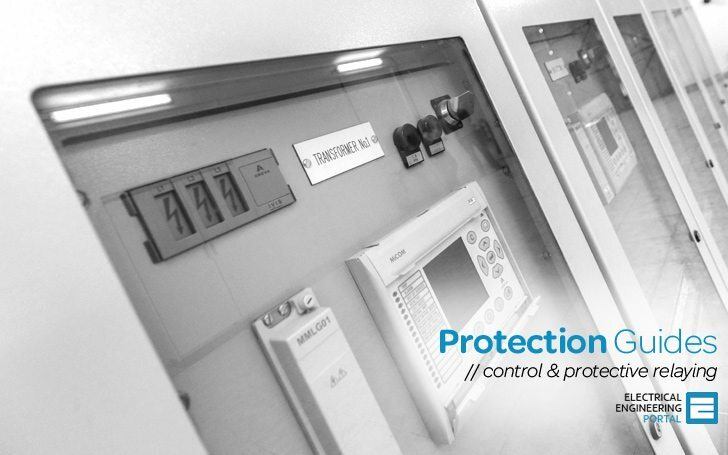 14 Basic principles in modern substation automation protection systems . 15 Guide through applications for SIPROTEC protection relays . 16 Lecture notes on switchgear and protection devices for students . 17 Calculation and prevention of short circuit currents in high voltage grids . 18 Line protection calculations and setting guidelines for relays installed at 765kV, 400kV, 220kV transmission systems . 19 Design Considerations For Protection System Of a Geothermal Power Plant . 20 Generating Power Plant and Transmission System Protection Coordination . 21 The Basics Of Overcurrent Protection . 22 Ground Fault Protection of Overhead Transmission Lines (Focus On Distance Relays) . 23 Principles and protection applications of low-impedance bus differential relay . 24 How to design Bay Control Unit (BCU) in a substation automation system . 25 Simulation of protection system with a source, circuit breaker, transformer and motor . 26 Circulating current scheme using IEC 61850 and relay logic for junior & graduate engineers . 27 Overcurrent and differential digital protective relays with monitoring capabilities . 28 132kV and 22kV busbar protection schemes of the new Hong Kong Electric’s stations . 28 Symmetrical components theoretical and real-world examples for relay engineers . 29 Course on switchgears and relay protection for students . 30 Arc-flash prediction and detection in MV/LV switchgear . 31 Secondary injection testing for transformer differential protection relay . 32 Unit protection of feeders (principles, schemes and applications) . 33 Restricted earth fault relay application within a 400kV shunt capacitor bank design . 34 Phase overcurrent protection on overhead MV feeders . 35 Analysis of power system faults (transformers, rotating machines, overhead and cable lines) . 36 Generator protection application and relay selection guide . 2 Relays – General . 5 Magnetic System – Coil . 7 Handling and Use in Production . 10 Electronics in and around Power Relays . Thank you!, sir, your relay protection updating details have very useful for me for relay testing. Today (11/19/2018) you published an article on protective relays polarity. I would like to download a copy. Thankyou. Dear sir, i would have the guideline document related to scheme preparation of protective lines , transformer , generator etc. sir pls tell me how differential relay works ? I have a crompton greaves drive in a equipment, i am unable to vary its speed from HMI. Also unable to find drive manual. In India What % of T&D Losses are standardized. Here is a short reply to your query.. Here in India 33kV, 22kV and 11kV level is considered as sub-transmission or HV distribution voltage level. Being a vast country distribution network and parameters differ widely from State to State and so does the T&D loss level. The loss level (which includes losses in HV lines and LT lines) in some pockets is around 10% and even less than that. However, it is as high as 30 to 40% in some rural and remote pockets. We have two Thyro-A (AEG) in our substaion and both of them flashing on pulse inhibit. we checked LED MESSAGES and have been detected that one of Frequency error or SYNC error can be occured, and SYNC error has more probability. If SYNC error be right fault, how can i remove it? Can you help me please? yes it is possible, when ever equipotential ring is disconnected from ct there is a chance of occuring error on measuring of ct, actual current flow on ct and measured current on ct will differ in that situation u get the trip from both differential and ref protection. please explain can we use measurement CT’s for protection relay ? if not so why ? because of the ct winding always short suppose it is used for protection it will be open that time huge current flow through the ckt and it will damage the property or human body. thanks u very much, I am interested for particpate and to became member of this website. please, can u give me the details of dry type transformer for the maintenance point of view.and also the over -under voltage relay…feeder protection relays..
Good Job boss, really inspired especially application enginners like us…. You have done a excellent job. This website is very useful for begineers and even for expert as well. Just joined after seeing reference on Linkedin and really impressed by the sites contents. Great work. Thank you for kind words Harjit! I wrote down your request, and I’ll try to find something. Congratulations for this website . Thank you Gilmar! Me and my team did a great efforts to make EEP to be like it is now.